I don’t mind parking farther away when I get to school early in the mornings. shopping for clothes is actually fun. I can bend over to tie my shoes without asking my husband to do it for me. I am starting to think about enrolling in fitness classes. I think more about the things I eat on a daily basis more than I ever did. I make better food choices than I used to. I can feel and see my collarbone. my clothes look the way they’re supposed to. I’m trying to learn to love myself more. I can hug all the way around my husband. standing up all day long to teach is preferable to sitting down. my joints do not creak and crack as much when I get up from chairs. the confident and sassy girl that’s always been buried under all this fat is starting to emerge. I am planning to start a running program. my body is taking on a new, foreign shape and I’m growing used to it. I’m learning to accept compliments on my appearance from others. One hundred pounds later…I still have 125 pounds to goal. I’m still feeling pretty awful…my throat is sore, my nose is snotty, and now they’ve brought a friend: an unwelcome cough. UGH. So. OVER. This. I haven’t been sick like this in over a year! And I’ve had my flu shot–I got it two weeks ago! I’m just glad the weekend is coming and that I’ll be able to get some rest on Saturday since I don’t have any commitments until the evening. Hopefully I’ll be able to get some rest in because I sure as hell need it! Today was a pretty awesome protein day: 89 grams. I decided I wanted fish for dinner tonight so I cooked up one of the crab-stuffed flounder filets I had in the freezer and added a bit of veg to my plate. Yummy! 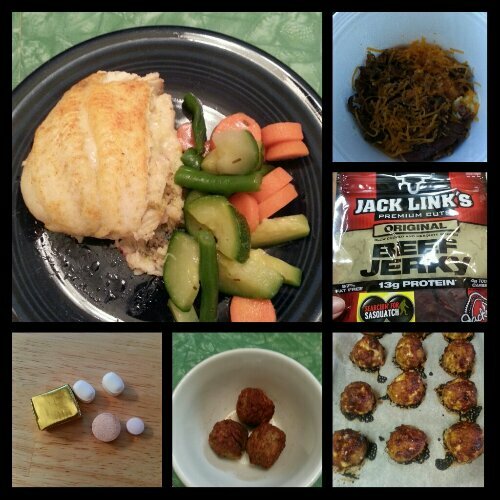 Today’s food choices, from upper right: Rudy’s ham, egg, bacon and cheese breakfast bowl (ate half); Jack Link’s beef jerky; cheesy barbecue turkey meatloaf with Trader Joe’s mashed potatoes and roasted corn (not shown); Trader Joe’s turkey meatballs (I had 2); multivitamin and calcium supplements x2, iron, B12, C, and D supplements; Trader Joe’s crab stuffed flounder with Green Giant Healthy Vision mixed veggies. This entry was posted in celebrations, daily bites, eating, NSV's, post-op, vsg, weight loss surgery and tagged daily bites, eating, little celebrations, NSVs, post-op eating, post-op life, sick, sorry for sleeve rocking, VSG, vsg realness, WLS. Bookmark the permalink.